JVC Camcorder to portable device converter. Multi-threaded conversion to provide fast speed. Excellent audio-video sync output processing. Deinterlace and remove image noise to get high video quality. Support VFW codec encoding and 5.1channel audio output. Convert your Blu-ray movies, DVDs with multi-channel audio/subs preserved. Rip Blu-ray (3D), DVDs movies and different videos to whatever format you want. Convert Blu-ray movies, DVDs with multi-channel audio/subs preserved. Rip BD/DVD to a wide variety of file types. Import and export MXF with multiple audio tracks. Pavtube TOD Converter for Mac is specially designed for converting TOD files from some particular camcorders like JVC GZ-HD300 into other video formats like FLV, MP4, MPG, AVI, MP3, FLAC, MKV, OGG, M4A, WAV, 3G2, VOB, SWF, and MOV on Mac OS X. With this amazing conversion tool, you can enjoy home videos freely on all popular portable devices like iPod, iPad, iPhone 4, iPhone 3G, Apple TV, PSP, BlackBerry, Creative Zen, iriver, Zune, etc. Or convert the footages to edit in iMovie, FCP and other editing software for working with. The TOD files can be converted to lossless MPEG2 files, other HD formats as well as common videos. It supports various output formats including FLV, MP4, MPG, AVI, MP3, FLAC, MKV, OGG, M4A, WAV, 3G2, VOB, SWF, and MOV for uploading online or enjoying on portable devices. Share the videos freely with friends and family. The output formats are acceptable to almost all portable players like iPod, iPhone, iPhone 3G, Apple TV, PSP, BlackBerry, Creative Zen, iriver, Zune, etc. You can also import the output videos to iMovie for further editing, or PPT or presentation. Or you can upload the video to YouTube, MySpace, etc. for sharing. This program adopts advanced audio and video sync conversion technology, which can perfectly convert TOD file without any out-of-sync problem. You can cut off the unwanted parts of a video with trim function; remove the black edges of the video with crop function. Besides, you can combine many videos into a single one with merge function. Pavtube TOD Converter for Mac enables you to add and edit the text watermark, image watermark as well as add the video watermark. The video watermark is amazing because it can reach an effect called Picture-in-picture. You can adjust the brightness, contrast, saturation, volume of the video and choose the specific effect model from Simple gauss blur, Simple laplacian sharpen, Aged film, Flip color, Invert and None. Owing to the Multitask and Multithread coding technology, the conversion speed of this program is marvelously improved, up to 2 times faster than other similar programs. A: Simply click ‘Settings’ button and set the Video Size to 1920*1080 or 1280*720 before converting the movie. - Fixed improper conversion issue with Kindle Fire profile. - Included Pavtube Streaming Server as a new feature. 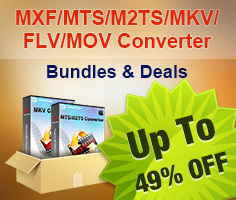 - Added support for MOD and AVCHD MTS/M2TS camera files. - Added support to export webm format. - Added Avid DNxHD 720p/1080p(*.mov) profile. - Added profile for Samsung Galaxy Tab 10.1, Motorola Xoom, BlackBerry PlayBook, Acer Iconia A500, Creative ZiiO 7, Creative ZiiO 10, Pandigital Novel 7 Tablet, and Samsung Galaxy S II. - Redesigned software GUI (Graphical User Interface). - Added new format template for Apple’s iPad 2nd Gen.
- Added customized H.264 video format for Motorola Droid X. - Added optimized formats for Android smart phones such as Motorola Droid, Google Nexus One, HTC Droid, Samsung Fascinate, etc. - Fixed for crash issue and some other bugs. - Now identifies interlaced video and applies Deinterlacing facility to these videos by default.